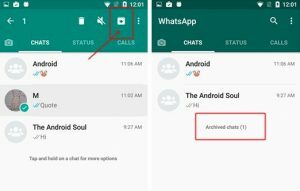 While you might have been aware that WhatsApp archives chats that you have, you may not have known that you have options like: viewing them, restoring them, or even unarchiving them. If you are among the majority of those using WhatsApp, you tend to keep your conversation lists tidy and neat so that your most used chats are easily accessible. Or, you might just be secretive and not want anyone to see the threads you engage in. Knowing  how to delete a conversation is very simple, but archiving a conversation is a much different task. “Archive Chat” allows you to hide a conversation and access it again later. Deleting is said to permanently remove the chat, though there are ways that you can get it back (that are more painstaking than archives). For those that are unfamiliar with the process, below you will find how to archive conversations, unarchive them, restore them, and simply view them. As with any android instruction, the steps might vary slightly depending on the make and model of your phone or device. From the chats screen, tap and hold the conversation you intend to archive. From the top bar, choose the “Archive” icon. This approach archives the conversation and it is no longer visible with the rest of the chats. Scroll to the very bottom of the Chats screen. Tap and hold on the saved conversation you want to unarchive. Select the “Unarchive” icon from the top bar. Tap “Menu” from the Chat screen and access “Settings”. Tap “Chats”, then “Chat History”, and then “Archive All Chats”. ☝ Note: Archived chats will reappear when you receive another message in that thread. This option does not get rid of the conversation itself, nor does it store the information to an SD card. Select “Chats” near the top of the screen. If a chat directly opens, simply hit the “Back” button in the top-left corner. Move to the bottom of the chat inbox. You can see an option for Archived Conversations here. If there is no option available, no conversation has been archived to this point. Tap “Archived Conversations”, this will open a list of all available options. Select the one that you wish to view, and it will open this conversation and allow you to scroll through its contents. The following process works for all Apple devices iOS 7 or later. From the Chats screen, slide you finger across the conversation that you want to archive, starting at the right and swiping left. Tap on the “Archive” option. You can also archive all chats at once via WhatsApp Settings, tapping Chats, and finally choosing “Archive All Chats”. From the “Chats” tab, scroll to the top left and then pull down. Conversations will automatically reappear when a new message comes through on the thread. You can manually complete this task by searching the list by contact name or message. From the “Archived Chats” screen, swipe across on the chat from right left. From Chats, tap the search bar. Here enter the contact or content from the chat you wish to delete. When you find the undesirable conversation, swipe that option from the right to the left. ☝ Remember: tapping this does not delete the chat nor does it back up to iCloud. Tap on “Chats” at the bottom of the screen. Swipe the middle of the screen and you will see “Archived Chats” in blue lettering at the top of the screen. If all of your threads are already archived, you will not need to swipe down to access the information. Tap “Archived Chats”. This will display the list of chats you have chosen to archive. If nothing appears, you have no chats that you have added to this point. Choose a conversation. Once it is open, you can view the entire conversation. You can also swipe left on the chat and send it back to your active inbox. Based on your device that you use, this procedure might vary slightly. From the Chats screen, long press a chat you wish to hide. From the available menu, choose “Archive”. The chat is now archived and will no longer appear among your active chats. You can also archive all of your chats by choosing More, then Settings, Chats and Calls, Archive All and confirming your selection. Long press the conversation you want to unarchive. From the available menu, choose “Unarchive”. A conversation will also unarchive once new messages are received. 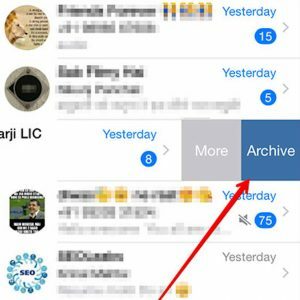 There are actually two ways that you can bring an archived WhatsApp thread back to your active list. The first is to view the archived chat you want to restore, and swipe left (or long press for some platforms) and from the menu choose “Unarchive”. This selection restores the conversation to the active list again. You can do this in another way by simply sending that contact or group a new message. Once it is sent, the entirety of conversation (included the archived portion) will restore itself to active threads. I can hope that I have given you all the information that you need, but if you have any questions or concerns, do not hesitate to drop a comment below so I can help you .